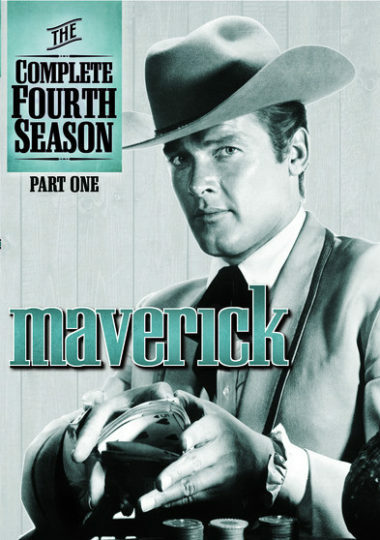 Maverick The Complete Fourth Season – Its the Moore the merrier as Jack Kelly teams up with new cast member Roger Moore for the fourth rollicking season of Maverick. Faces may change, but the card and con games remain the same, as Beau Maverick (Moore) deals himself in with his cousin Bart (Kelly) as they take on murder frame-ups, crooked sheriffs, cursed goldmines, comely witches and more in this complete 32-episode collection. Featuring appearances by Spaghetti Western icon Lee Van Cleef, Oscar-winner George Kennedy and The Time Tunnels Robert Colbert as the third Maverick brother Brent, Season Four highlights also include James Garners final series appearance (The Maverick Line), director Robert Altmans episode Bolt from the Blue and Hadleys Hunters, featuring cameos by Warner Bros. legendary Western stars John Russell and Peter Brown (Lawman), Ty Hardin (Bronco), Will Hutchins (Sugarfoot) and Clint Walker (Cheyenne).